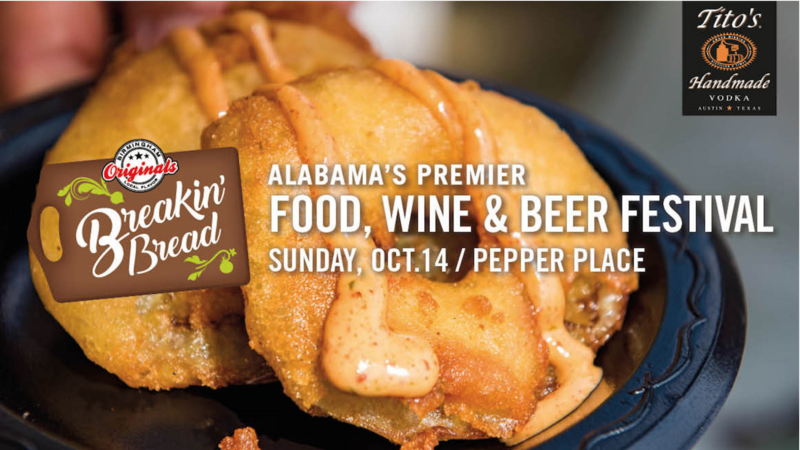 Join the Birmingham Originals at Pepper Place Sunday, Oct. 14 for the 16th annual Breakin’ Bread presented by Tito’s Handmade Vodka! Enjoy a day filled with unlimited food sampling along with craft beer and wine, a makers’ market comprised of craftsmen from Pepper Place Market, a kid’s zone with special activities for children, live musical entertainment from Todd Coder Duo, Taylor Hunnicut and Alvin Garrett and more! Proceeds from the event will benefit Jones Valley Teaching Farm’s (JVTF) Urban Farm Project. General Admission is only $35 and includes unlimited food samplings and two drink tickets for wine and beer. VIP tickets are $99 and guests will enjoy unlimited food samplings, unlimited wine and beer, early entrance to the event at 12:30 p.m. and access to the exclusive lounge area. (Early Bird price is $85 if purchased before Sept. 1! Limited quantity available!) Children 12 and under enter FREE when accompanied by an adult and have access to unlimited food sampling, non-alcoholic beverages and the children’s area.